The Old and The New came close to clashing at the CFA Society’s Wealth Management Practitioner’s Workshop on the 19th of November 2016 in Bengaluru. Bringing up the Old Guard, as some would argue, was Robert Dannhauser, CFA, who directs the global private wealth management practice of CFA Institute. He spoke about the need and the best practices around Risk Profiling of clients and Investment Policy Statements. The second speaker was Ravinath Dasika, CEO of Tavaga, a robo-advisory platform based on exchange traded funds. 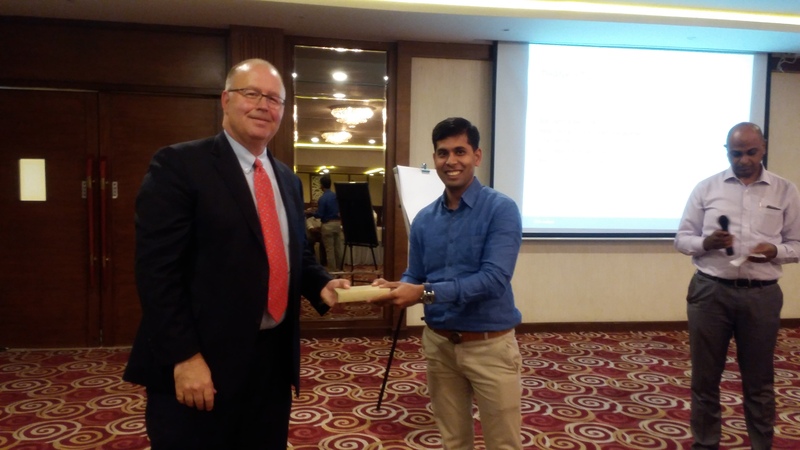 Ravinath shared some interesting insights into Gamification and how the same could be used to transform Personal Finance. Considering purely, the content of their session, one would assume that Bob and Ravi represent two world-views which are completely inimical to each other. But after looking at how the afternoon unfolded, our audience had reason to believe that these two forces could after-all be complimentary. In Robert’s opinion risk profiling is driven by two imperatives, regulatory and business. SEBI details the rules and regulations around risk profiling of clients, designed specifically to protect consumers from miss-selling. Since preventing miss-selling is central to the idea of all regulation, this condition is a handy test for any dilemma that arises due to lack of clarity in the rules. The second imperative is the business itself. Studies have shown that risk profiling using either commercially available surveys or proprietary products have been found to be more accurate than an individual’s assessment based on conversations with the client. It is simply because these surveys do not suffer from the biases that a human being is bound to have while performing an assessment. A better understanding of the client’s risk preferences increases the likelihood of them sticking to the portfolio designed for them. The two imperatives more than justify the time and effort that is required to be spent on a Risk Profiling exercise. It forms the foundation that eventually determines the sustainability of the professional relationships. The risk profile is a function of various factors, which Robert refers to as the dimensions of risk for example; Risk capacity, Risk need, Risk tolerance. Risk Need is the risk the client needs to take in order to earn a return that would satisfy their goals. A quantitative dimension that professionals love because it involves numbers. Risk Composure, on the other hand, is a subjective assessment of a client’s ability stay calm in times of turmoil. This dimension arguably has more to do with psychology than finance. The CFA Institute provides a lot of material around Risk Profiling which is also freely available on their website. It covers Risk dimensions, Behavioral Investor Types, the various genetic, societal and cultural predispositions that a person might have. Human beings can never be put into clean buckets, but these classifications provide vital guidance and signs to look for. Having understood a client’s goals and preferences, it is important to put these in a formal document along with other terms and conditions that would govern how the portfolio is managed. The Investment Policy Statement (IPS) has the consent of both parties and effectively places accountability where it is due. It forms a pre-agreed framework within which both parties can function. It also provides ease of transition from one wealth manager to another. Details on the elements of an IPS and best practices followed have also been made available on the CFA Institute website. Ravinath is convinced that the power of gamification can be used as a tool to help people achieve their goals, by pushing them into actions and then habits. This approach drives his young company, Tavaga. A successful game, Angry Birds, for example, derives its attraction from three fundamental factors that any game must have in good measure; fulfilment, achievement, and vanity. Fulfilment means the presence of conditions that a person must fulfil to clear a stage. For instance, collecting fifty gold coins in a game to clear the stage and a clear path that would help them achieve this. It gives the player a sense of control over their destiny, which is an essential element of the fulfilment factor. They improve their skills and the achievement comes next when the person is able to progress to the next challenge. The vanity factor is often satisfied by providing badges or medals that can be flaunted on Social Media. Based on what is understood about the millennials, and their inability to save, Ravi and his team are attempting to gamify personal finance. Through their App, that employs the same factors of gamification as mentioned above; they intend to help the users first to start saving for consumption-based goals such as a vacation or a rock concert. It gets them into the habit of saving for predefined goals spread over a timeline. Gradually, the same habit can be used to get them to invest for the longer term. That is how gamification and its addictive power can be used to incentivize productive behavior that adds up to the right habits. The second aspect of the platform is the fact that it invests in ETFs, which have a cost advantage over their rivals that rely on active management techniques to earn returns. The jury is still out on the ability to earn alpha consistently in the Indian Markets and hence the extent of the appeal of passive fund management techniques is undecided. This debate is also central to the differences between the old ways and the new. However, what one cannot dispute, is the influence of the irrational human element and how psychology often governs our decisions and point-of-view. And this is precisely where the Old and the New can come together. Use of technology and our understanding of human psychology can make traditional wealth management practices more efficient than ever before. Whichever way it goes, Wealth Management is at a cusp, awaiting dramatic change! This entry was posted in Bengaluru, Events, Speaker Events and tagged Bengaluru, CFA Institute, CFA Society India, IAIP, Indian Association of Investment Professionals, Neelabh Mishra, Ravinath Dasika, Robert Dannhauser CFA, Robo-Advisors, Robotics, Tavaga, Wealth, Wealth Management. Bookmark the permalink.